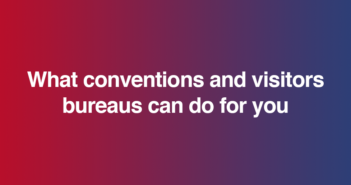 The Fredericksburg (Texas) Convention and Visitors Bureau (CVB) is committed to making your reunion a success. Staff can assist with planning and executing your reunion and will help with selection of facilities, services and off-site activities that best fit your requirements. They are dedicated to providing personal attention to make a memorable reunion in Fredericksburg. CVB services for reunions include coordination with local arrangements, brochures and literature, coordination of any special event or activity, local publicity for your reunion, ideas for tours and activities, use of audio and visual equipment, registration assistance, and name tags. Group tours usually require 20 people. Learn more about Fredericksburg at www.fbgtx.org. For information or a free copy of the Fredericksburg Meeting and Reunion Planner, contact 888-997-3600, ext. 233; marketing@fbgtx.org. Looking for a surprise? Fredericksburg, in the heart of Texas Hill Country, is not on the beaten path but has so much to offer, it should be on many reunions’ paths and plans. It’s an easy 70 miles from San Antonio (the nearest major airport), and away from urban congestion. History intersected this area and left behind some diverse and fascinating surprises to intrigue and enchant many reunion members. Settled in 1846 as a German community, this ethnicity is amply apparent still today in many aspects of Fredericksburg life. German words and themes abound deep in the heart of Texas: restaurants, foods, décor, some signs (Main Street is subtitled Hauptstrasse) and the Vereins Kirche, the symbol and center of town. In fact, as late as the 1960s German was commonly spoken. The Pioneer Museum Complex. Photo by Trish Rawls. Click to enlarge. The center of Fredericksburg is the site of almost back-to-back year-round events and festivals in Marktplatz (Market Square), notable as the center of earlier community life. A copy of the original Vereins Kirche (community church to settlers) and a typically decorated German Maibaum (Maypole) dominate the square, visible from all directions. Vereins Kirche is part of and a couple of blocks from a well presented Pioneer Museum Complex where many aspects of early settlers’ lives come clear in displays and demonstrations. “How did they make it?” is the consistent comment of visitors. The area includes the strength of historic sites and places, connections to military history, nature adventures and local produce, wines and beers. What will you need to make your members happy? Golf? Shopping? Nature? Wineries? Outstanding food? History, history, history? Fredericksburg’s got it all and more. Lyndon B. Johnson State and National Historic Parks in nearby Johnson City, Texas, include the former President’s boyhood home and The Texas White House, where Lady Bird Johnson still maintains a part-time residence. 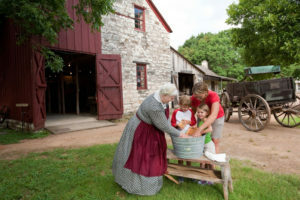 The Sauer-Beckman Living History Farm is a working farm that recreates 19th century Texas pioneer life. Lyndon B. Johnson National Historical Park tells the story of our 36th President, beginning with his ancestors and the influence of his family and his beloved Texas Hill Country. In Johnson City, you’ll see how LBJ brought US government resources to his friends and neighbors. Visit a working cattle ranch to experience the serenity and beauty from which the former president drew his strength. He is buried at this site. The Johnson family generously continues to add to this 1,570-acre property. Fredericksburg Herb Farm is a celebration for the senses; their candles and bath, body and culinary products are featured in Neiman Marcus and other fine retailers. Wildseed Farms, the largest wildseed producer in the US, is home to acres of colorful gardens where visitors can pick their own flowers, and the new 3,000-square foot Butterfly Haus at Wildseed Farms; visit www.wildseedfarms.com. You’ll want to take a self-guided walking tour through the National Historic District In Fredericksburg to learn about the German pioneer history, folklore and architecture of this Hill Country community. The Pioneer Museum Complex is a collection of authentic structures preserved from 19th century German pioneer days, including the Vereins Kirche Museum located at the city’s Marktplatz. Fredericksburg’s Main Street features more than 100 specialty shops offering clothing, home accessories, antiques and unique collectibles. 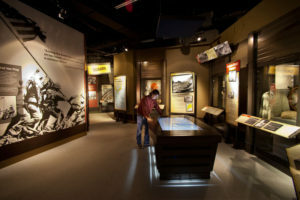 The National Museum of the Pacific War. Photo by Marc Bennett. Click to enlarge. 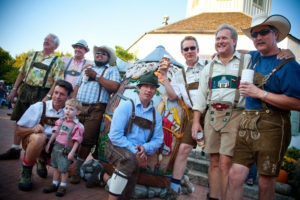 Oktoberfest, one of Fredericksburg’s favorite festivals. Photo by Steve Rawls. Click to enlarge. and dance at Oktoberfest, one of Fredericksburg’s favorite festivals. 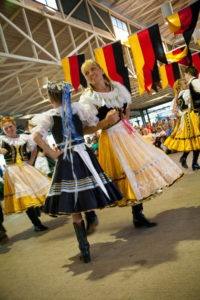 Stages focus on German favorites of oompah, polka, and waltzing, with exhibitions, contests, and many opportunities for dancing, including the irresistible Chicken Dance! Many find it the ideal opportunity to start their holiday shopping with many unique, handmade gift items. Of course, the best of the celebration is the hearty menu of delicious German and Mexican-American foods: fajitas, tacos, burgers, sausages on a stick, kraut, salads, strudel, and over 30 varieties of domestic and imported beers. Contact Oktoberfest at 830-997-4810; www.oktoberfestinfbg.com. The new Heart of Texas Wildlife Trail West is a two-part (east and west) driving trail, comprises 55 counties, designed to showcase Texas’ wildlife and cultural heritage and promote land conservation. Hike to the top of Enchanted Rock, the second largest granite dome in the US, for a stunning view of the Texas Hill Country (note that this is a fairly strenuous climb) OR take an easier hike on “E Rock’s” Loop Trail and enjoy majestic views of this rock formation. Photo by Steve Rawls. Click to enlarge. Hauptstrasse (Main Street) was built wide enough so that an ox cart could turn around. It can still accommodate a turnaround today, but now it’s minivans and SUVs. Fredericksburg started as an agricultural community and maintains that heritage and an impressive list of specialties, including peaches and pecans. It is known as the “city of steeples” for the large number of churches and religious denominations. Tourism has taken a giant step forward and is a significant part of the economy along with the rural cultural heritage that adds to the quality of life. Fredericksburg: an ideal reunion location Jim Cannon, New Braunfels, Texas, organizer of the USS Ashland (LSD-1 and LSD-48) reunion, sings the praises of Fredericksburg and of the Convention and Visitors Bureau’s Darryl Whitworth, whom Cannon says made it all work. Cannon chose Fredericksburg because it’s a “clean, friendly city with a unique museum for a Navy ship’s reunion.” Whitworth provided packets at registration with helpful information about the area. Nimitz Museum staff also helped with a memorial service and a dedication of a plaque on the Memorial Wall in the garden. Cannon, whose wife’s name is Bobbie, says planning a reunion takes a great amount of help from your sweetheart. The group visited the Alamo in San Antonio and saw the Imax movie “The Price of Freedom is Not Free.” They visited the LBJ Museum and boyhood home, and the Wildflower Flower and Seed shop. SIDEBAR Lodging In Fredericksburg and surrounding Gillespie County, 335 bed and breakfasts include cottages, Sunday Houses, bed and no breakfast, bed and brew, and a multitude of motels. Hangar Hotel, 155 Airport Rd, Fredericksburg TX 78624, is a first class venue with conference and banquet space and a 1940s-themed diner. Edith Wagner is editor of Reunions magazine. Next Article Report from a Seminar@Sea!